Every two years, Graded develops and hosts the Innovate Conference. This year, from October 19-21, educators from around the world will visit Graded to learn about innovation in education from experts, faculty, CEOs, and students. The Innovate Conference is unique not only for the topics it covers, but also for its ability to engage students and parents alongside faculty members. By including parents and students, the conference brings greater depth to teaching and learning and provides an opportunity to develop a common understanding and vocabulary. Further, opening our doors to the broader community enables greater support for ongoing professional development of Graded faculty. This year, the Innovate will focus on personalizing the conference experience. Participants have been asked to create their own program, based upon their goals and how they learn best. Innovate will invite all stakeholders in education to take part—administrators, coaches, teachers, counselors, specialists, and assistants—while featuring students at the heart of this endeavor. The selection of Keynote and Deep Dive speakers for the 2017 Innovate Conference intentionally focused on the areas of the Strategic Plan that support Graded’s mission and vision. The goal of the conference is professional development that is job-embedded and continues beyond the three days of Innovate. 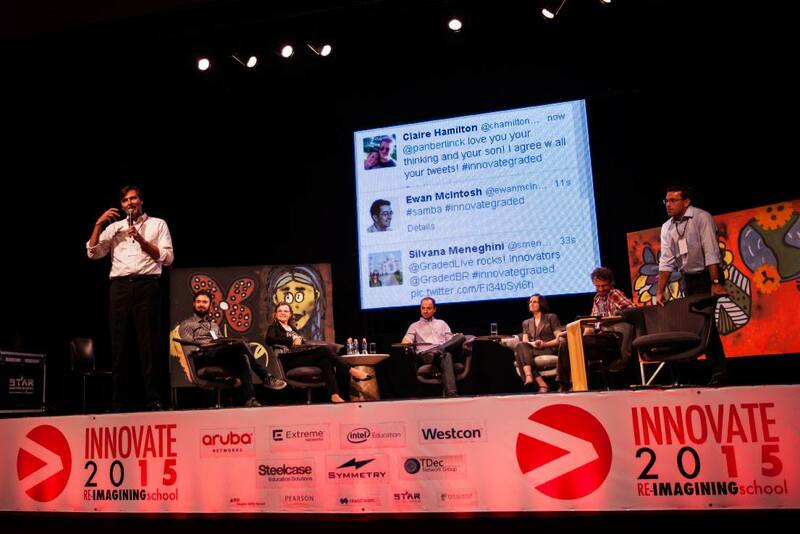 Innovate will feature several prominent speakers from around the world. One focus of Graded’s Strategic Plan is to “deliver inspirational instruction that addresses the academic needs of every student." Dr. Virginia Rojas, who conducts professional training on effective programs and strategies for English learners from preschool through grade 12 for English as a Second Language (ESL) and classroom teachers, will be one of the conference’s keynote speakers. She has worked with more than 300 international schools on language education policies, programs, and professional development. Dr. Rojas specializes in developing academic English as an Additional Language (EAL) and in providing access for English-proficient bilinguals through differentiated instruction and progressive scaffolding. She provides professional development sessions, job-embedded coaching, demonstration lessons, and linguistic audits of ESL and EAL programs. Dr. Rojas will be offering an opportunity to obtain a micro-credential that focuses on collaborative planning implementing effective instruction using strategic co-teaching models. In his presentation titled “Tomorrow-Ready Education: Preparing Students for the Challenges of Today and the Promise of Tomorrow,” Dr. Mark Milliron will focus on one of Graded’s Strategic Plan goals, which is to support and initiate best practices in teaching through research, innovation, and evaluation. Dr. Milliron is an award-winning leader, author, speaker, and consultant who works with universities, community colleges, K-12 schools, foundations, corporations, associations, and government agencies across the country and around the world. He is co-founder and chief learning officer of Civitas Learning, a social-purpose corporation. Dr. Milliron also serves as executive director of the Next-Gen Leadership Academy, a program dedicated to grounding rising educational leaders in the issues and innovations of the day, and developing the leadership skills necessary to help institutions thrive in dynamic times. optimizing a learning mix that includes more fluid and increasingly digital curricular resources and strategies, including open education, accelerated learning, competency-based education, game-based learning, and more. embracing the imperative to champion “tomorrow-ready learning” grounded in rich tradition, but tuned for the fast-moving dynamics of the road ahead. Mr. November’s presentation, “The Emerging Culture of Teaching and Learning,” will focus on supporting and initiating best practices in teaching through research, innovation, and evaluation and effectively preparing students to handle the academic and cognitive demands and skills necessary for success beyond high school. He will discuss how access to timely information and communication tools can empower educators to address the individual learning needs of their students. These same tools can lead to a wealth of benefits, such as greater collegiality, stronger relationships, self-directed students, curriculum-aligned technology, authentic work, rigorous and motivating assignments, and the development of a strong learning community. Dr. David Conley is a national thought leader in several areas including college and career readiness, student ownership of learning, systems of assessment, and new models of educational accountability. He has conducted numerous research studies on what it takes for students to be ready to succeed in college and careers, and he writes extensively on this topic. He has published multiple articles and policy briefs,as well as three books in this area, including his most recent book, Getting Ready for College, Careers, and the Common Core: What Every Educator Needs to Know. Dr. Conley’s presentation, “Complexities and Multi-dimensions of College and Career Readiness,” addresses the issue of effectively preparing students to handle the academic and cognitive demands and skills necessary for success beyond high school. Most schools focus on content knowledge acquisition as the holy grail of schooling. However, college and career readiness are far more complex and multidimensional than merely knowing the skills to get into college or get a job. What happens when students can learn much of what they need for college and careers outside of school, on the internet, and elsewhere? What is the value of school? And what will colleges want to know about students in an era when the emphasis is on a host host of thinking skills that require content knowledge but go well beyond simply repeating facts? This session draws upon more than 20 years of research on the topic of college and career readiness, and weaves in what we know today with what we will need to know and do tomorrow. Finally, collaborating with students during this conference is what makes Innovate innovative. Our three days will include keynote addresses from education experts, and students will engage in presentations including facilitating transparent conversations with teachers. Simultaneously, we are running Start Up Stay Up, an exciting 48-hour social entrepreneurship boot camp for students in grades 9-12. The event culminates with a Shark Tank-esque venture capitalist panel. CLICK HERE to register no later than October 10. Education is constantly changing. Graded honors the work of our faculty and their need to grow through its focus on professional development. The Graded Strategic Plan highlights elevating professional growth and practices by investing in effective, innovative teachers, staff, and leaders. Innovate is the Graded approach to meeting the needs of our faculty and students by valuing their professional growth and professional learning.